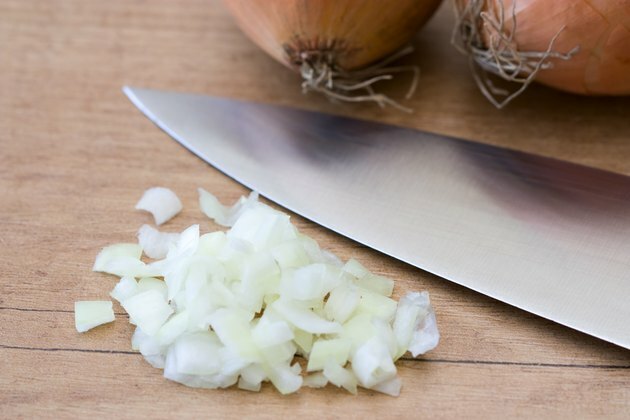 It's obvious that onions are more than a garnish in the United States; the National Onion Association reports that Americans eat 20 pounds of onions per capita each year. Whether you enjoy the strong flavor of raw onions or their sweetness once caramelized, you may not realize that onions also have a history of therapeutic use. Their effects on both cholesterol and blood sugar have been the focus of scientific study, but solid conclusions are still elusive. Onions belong to the same biological category as garlic, leeks and chives. They are grown throughout the world, although they are thought to be native to Europe and Asia. Onions' healing power can be traced to the 17th century, when New World explorer Pere Marquette ate them to prevent starvation. Onions' sulfur content gives them their characteristic odor and may play a role in their health benefits. Onions contain the antioxidant called quercetin. Quercetin intake is associated with decreasing heart risks such as arterial hardening, high blood pressure and heart attack. Cholesterol accumulation contributes to clogging and hardening of the arteries. Cholesterol also is a major component of gallstones. Findings published in June 2009 in the "British Journal of Nutrition" revealed that both raw and heated onions reduced cholesterol gallstone development up to 39 percent, although the study was conducted on mice. Much of the research on onions' efficacy has been done on animals, so it's unclear how effective they may be in reducing cholesterol in humans. Research on how onions affect blood sugar in humans has been more extensive. The sulfur compound called allyl propyl disulphide may increase insulin production and lower blood glucose levels. An October 2010 preliminary study published in the journal "Environmental Health Insights" found that red onion was effective at reducing blood sugar in people with diabetes. Glucose readings in type 1 and type 2 diabetics fell and remained lowered for four hours after eating. More research is needed, but these findings suggest that onion could be helpful in diabetes management. Onions are a popular food throughout the world and are generally safe. Like most things that can be consumed, however, side effects exist. This is particularly a concern if you're consuming large amounts of onions daily. Symptoms associated with heartburn may worsen if you already have this condition. You may be at higher risk for an allergic reaction, such as itchy eyes and a skin rash, if you have asthma. Much of the scientific evidence regarding onions' benefits for cholesterol, blood sugar and other health concerns are still inconclusive, so don't stop taking any medications your doctor prescribes. What is the Carb Count in Onions?